From June 1st, 2018 the Bodleian Libraries will be presenting an exhibition of Tolkien‘s life and works of special magnificence. Drawing from the vaults of their Tolkien archives and the manuscript collection at the Raynor Memorial Libraries at Marquette Univerity this is the first major exhibition on this scale since the Centenary Exhibition of 1992 and both in its scope and relevancy the exhibition of a generation. Raynor Memorial Libraries’ own extensive Tolkien collection contains the original manuscripts and multiple working drafts for three of the author’s most celebrated books, The Hobbit, Farmer Giles of Ham, and The Lord of the Rings, as well as the original copy of the children’s book Mr. Bliss. 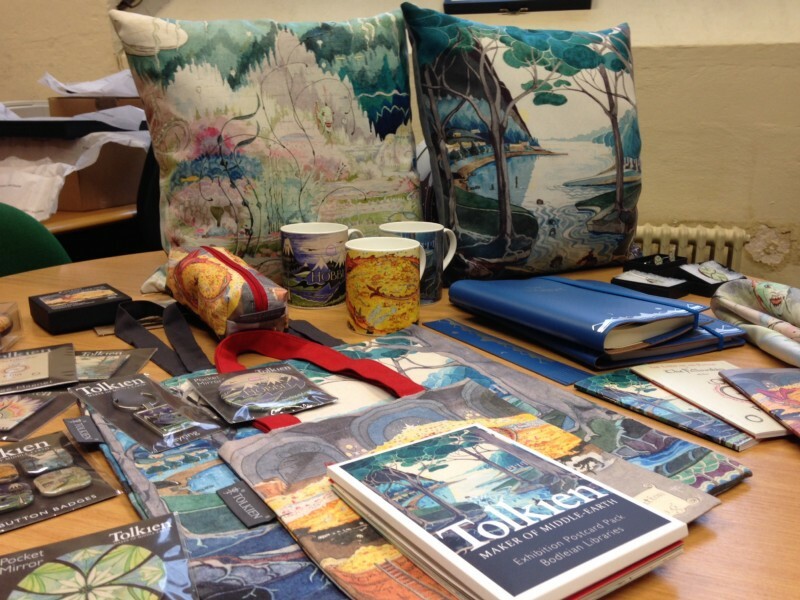 The collection includes books by and about Tolkien, periodicals produced by Tolkien enthusiasts, audio and video recordings, and a host of published and unpublished materials relating to Tolkien’s life and fantasy writings. This richly illustrated book explores the huge creative endeavour behind Tolkien’s enduring popularity. Lavishly illustrated with over 300 images of his manuscripts, drawings, maps and letters, the book traces the creative process behind his most famous literary works – The Hobbit, The Lord of the Rings and The Silmarillion and reproduces personal photographs and private papers (some of which have never been seen before in print). If you can still get your hands on the collectors’s edition – it [su_highlight background=”#dee2de”]is printed with special endpapers reproducing Tolkien’s drawing of the Elvenking’s Gate,[/su_highlight] amongst many other things. [su_pullquote]”Delicate, round, ceramic ear-rings based on Tolkien’s circular, heraldic device for his Elven princess, Lúthien.”[/su_pullquote]In an extensive blog post on Medium the Bodleian Libraries showed what fans will come to expect from this particular exhibition. I have to warn you, though, your wallet will possibly be stretched to the extreme if you go to Oxford and visit the exhibition shop afterwards! At the time of writing I am sitting in my favourite café in Oxford, Greens that is (directly adjacent to the Eagle & Child), I am browsing through the Bod’s video tweets, short teasers telling you bit more about what to expect from the exhibition. I can’t wait! Next story Join us for Tolkien/ Hobbit Week!